Traditionally , at the closing ceremony were given other festival awards including special awards " Golden Camera 300 " for outstanding contribution to world cinematography . This year's recipients of this award are festival director of photography Agnes Godard and actress IsabelleHuppert , handed by Culture Minister Elizabeta Kanceksa-Milevska. Earlier , in the lobby of the hotel " Epinal " Minister of Culture donate icon " Angel of Kurbinovo " to the French actress Isabelle Huppert, from the workshop of the Monastery of Zrze and to French cinematographer Agnes Godard and was donated silver butterfly in frame , motive of the rich Macedonian cultural heritage . 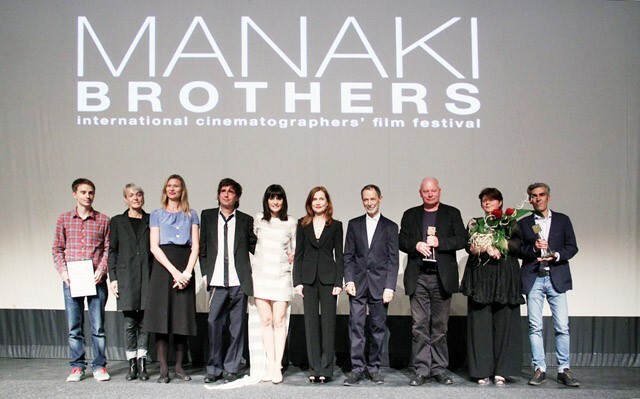 - Festival " Manaki Brothers" is an ode to the love between cinematographers and camera . The festival reminds us of the great photographic and film works, of the undeniable factual and aesthetic values ​​of the rich treasury of brothers Milton and Janaki Brothers . Thirty- fourth edition of the International Film Festival " Manaki Brothers" this year was in the spirit of the indicative phrase " Let the light in". As good hosts , we opened the window and it, despite the closing of the festival remains open for light from distant areas , and for the light that comes out of us - said , among other things , Minister Milevska at the closing evening of the Festival in Bitola .